Elizabeth "Lizzie" Olsen, the breakout star of last year's Martha Marcy May Marlene and the lead of this month's Liberal Arts, is no ingenue when it comes to eating. She packs her own seasonings when traveling, dreams of hunting boar with Eric Ripert, and only flashes her last name (she's the younger sister of Mary-Kate and Ashley) to get reservations at her favorite restaurant. Oh, and she was way ahead of the butchering curve. You just got back from filming a movie in Serbia and moved into a new apartment. How's the kitchen? Elizabeth Olsen: I love it, but I can't find my spices. I think I left them at my sister's, because I travel with them. I like my sea salts with me at all times. You're from California but live in New York. Let's compare the food scenes. EO: I just realized that the L.A. food scene is really good right now. I've been to Ink and Son of a Gun and Black Market. I hung out with Michael Voltaggio at Ink--that was fun. We'll get back to that. Tell the truth: Does the last name help you score good tables? 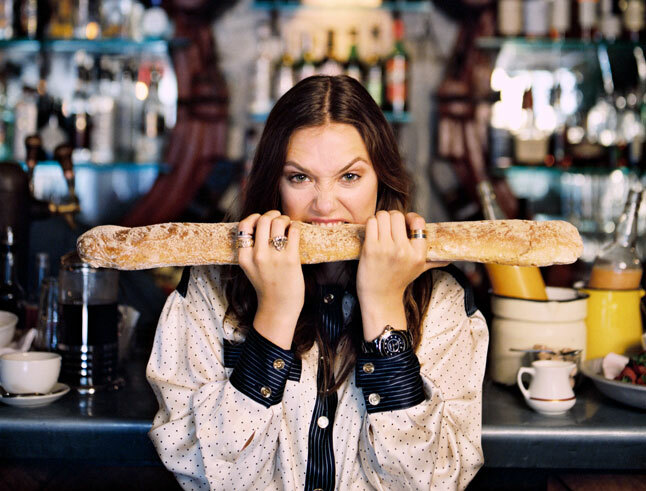 EO: I only use it at Il Buco in New York, because it's one of my favorite restaurants. If they say they're booked, then I'm kinda like, "Okay, well, I'm in the computer..."
There's a pappardelle to die for at Vetri. EO: The only pasta I ever order is the Bolognese at Bar Pitti in the West Village. Normally I don't feel like having a belly full of pasta. EO: No. I look at some actresses and say, "There's no way she eats." That's not me. I get way too much happiness from good food. EO: Very! For my first dinner party when I was 17, I wanted to make lamb chops. I bought a full lamb and tried to butcher it--an entire lamb, fat flying everywhere, limbs, you know. My mom was like, "Lizzie, you can ask someone to do that!" I had no idea. If acting doesn't work out, you can always become a butcher. EO: [Laughs] I would love to date a chef. I'd probably get really fat, but I don't care. YOu just have to send me through email your looks and a bio. Don't forget to add your URLS .If you have any questions feel free.